Lower School students are celebrating Women's History Month and the phenomenal accomplishments of many women. 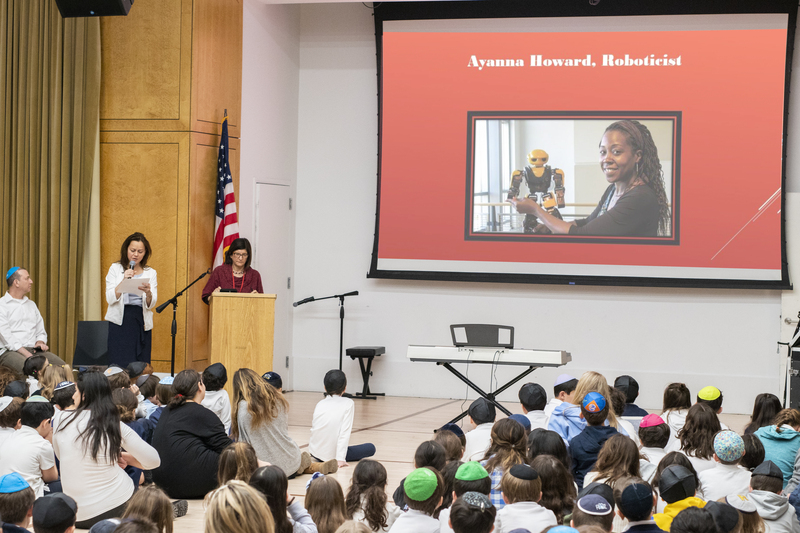 They were introduced to the history behind the dedicated month and learned about Roboticist, Dr, Ayanna Howard; All Star, Olympic gold medalist and WNBA league MVP, Lisa Leslie; Alice Miller who fought (and won) in Israel's Supreme Court for the right to be a part of the male-only pilot course in in Israel's Air Force; Danica Patrick, professional car racer; Golda Meir, fourth Prime Minister of Israel; Dr. Peggy Whitson, astronaut and commander on the International Space Station. Learning HERstory has generated a great deal of excitement and a buzz about what's in store next. So what's on the agenda? The Library's featured book for this month is I Dissent! Ruth Bader Ginsburg Makes Her Mark by Debbie Levy. Ms. Levy will spend March 14 at Ramaz, speaking to students in grades 1-4 about the writing of this book. The Lower School will also enjoy a special lunch inspired by women chefs. In celebration of Women's History Month there will be interdisplinary activities in General and Judaic Studies classrooms and in all specialties including Science, Art, Music, Technology, Math, and Physical Education. Our closing assembly at the end of the month will feature a panel of very accomplished women from right here in New York City!